Hutongs -- the famous ancient city alleys in Beijing - are disappearing from Beijing's city map every year as ring roads, viaducts, skyscrapers and modern homes creep into China's fast-growing capital city. 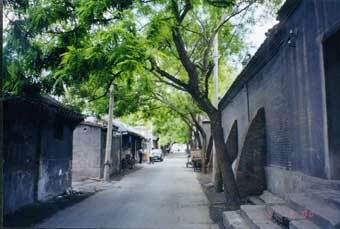 More than 60 hutongs vanished during 2002 alone, according to the Beijing Yearbook 2003. Historic places such as Biandan Hutong (Shoulder Pole Alley) and Kusi Hutong (Bursary Alley) have made a permanent home in the minds elders and literary works. In a bid to shelter the hutong culture from the rising city skyline, the Beijing Chorography Committee (BCC) began a survey to record the history of all existing hutongs. "We have almost completed the collection of information for the hutong chorography," said an official of the BCC's office in Xicheng District, where there is a large cluster of hutongs. The survey, started last September, targets both geographic data and the historical evolution of hutongs, the official said. The survey findings is expected to be compiled into a hutong chorography where every hutong in Beijing will have its own entry.